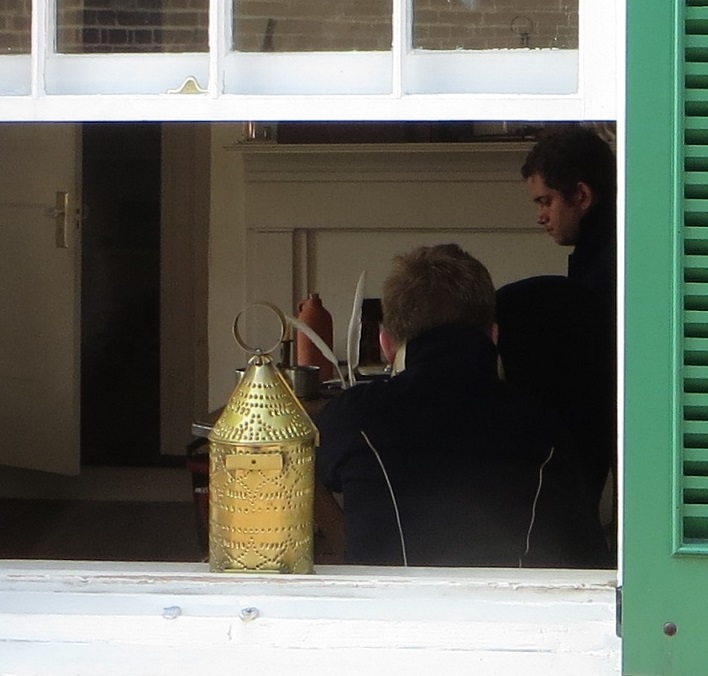 “What are you doing, all alone?” I asked a man in early 19th century military uniform, sitting at a desk in an exhibit room at Fort McHenry. He stared at me for a moment, as if annoyed at being engaged. “Waiting,” he finally replied. 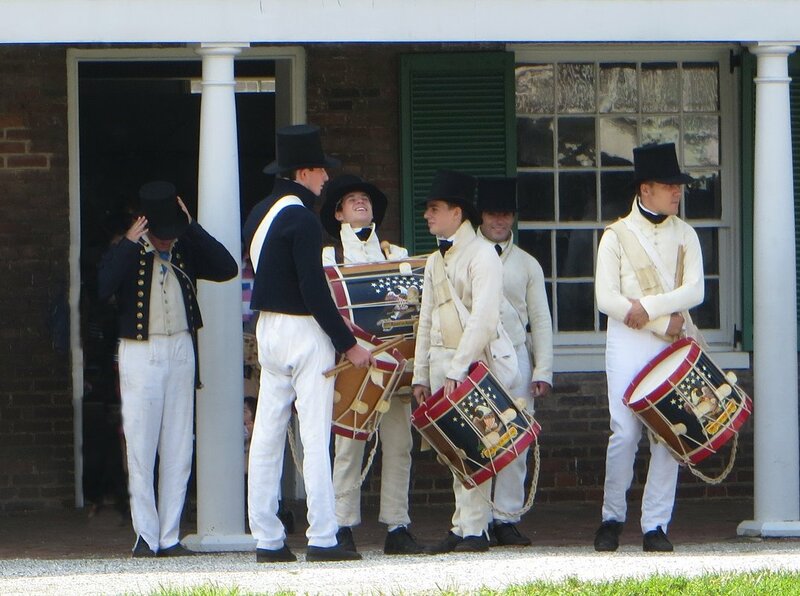 This is Marine Corps Weekend at Fort McHenry, with volunteers from the U.S Marine Corps Historical Company garrisoned at the fort to interpret the role of the US Marines in the War of 1812. Grump McGrump was not a Marine. Volunteers with a reenactment group called the Fort McHenry Guards were also there. I knew the answer. I’d seen them march in formation a few minutes earlier, out to an area just outside the fort. But this post was already beginning to form in my mind, so I questioned on. I nodded my head encouragingly, as I’d been taught to do in a counseling class to engage reluctant patients. But instead of talking on, he nodded his head in rhythm with mine. Was he mocking me? I raised teenagers. I worked for the U.S Congress. I know how to deal with recalcitrant. I was on the verge of another question — I could go on as long as he could — when a ranger announced the start of a canon firing demonstration on the battery. That’s where all the other reenactors and tourists had gone. I was torn: continue to torment him or watch the demonstration. The demonstration won out. “Thank you for explaining that to me,” I said. He shrugged and looked away. Troops at Fort McHenry, at the entrance to Baltimore Harbor, successfully defended themselves and Baltimore from the British fleet during the War of 1812. Its enduring claim to fame is not so much that it won that battle, however, but that lawyer Francis Scott Key, after watching the fighting, was moved to write a poem that would become the lyrics to the U.S. national anthem. 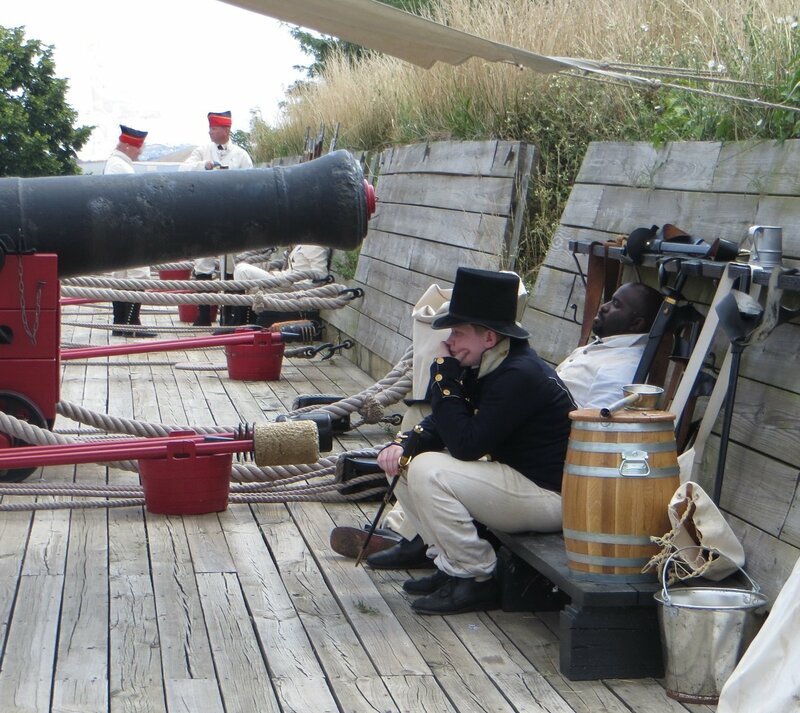 Fort McHenry is having a series of special events throughout this year and next, commemorating the 200th anniversary of the War of 1812. It all culminates with the anniversary of the Battle of Baltimore in September 2014. Gallery | This entry was posted in Maryland and tagged Baltimore museum, Battle of Baltimore, Fort McHenry, Fort McHenry Guard, Francis Scott Key, War of 1812. Bookmark the permalink. Too funny. At least I hope you enjoyed the canon demonstration. We get lots of canon firing here, queen’s birthday, Duke of Ed’s birthday, queen’s accession to the throne, and probably others that I can’t remember. You can get a free pass to go down on the dockyard to watch too. I haven’t been for a while as I keep forgetting they are on. I did enjoy the cannon demonstration — especially the part when it made all of the joggers running nearby run faster.